Anyone who is anyone attends the annual Association of Planets gala, the largest, fanciest soiree in the galaxy. Escorted by her husband Brock, Penelope “Pia” Aaron attends the event to mix and mingle with the galaxy’s power elite to further her career as an AOP ambassador. Brock Mann isn’t there to serve as his wife’s plus-one. And then Pia is taken. Without knowing who or why she was targeted, Brock must race against the clock to find his wife before she’s killed. Saving the girl and the galaxy just got personal. 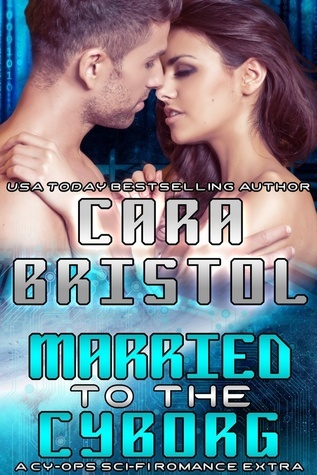 Married to the Cyborg is an exclusive Cy-Ops Sci-fi Romance, available only to subscribers of Cara Bristol's author newsletter. 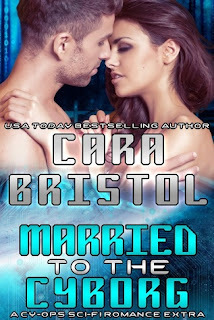 To subscribe, visit the author's website: carabristol.com. I read a couple of this authors books and liked them so I subscribed to her newsletter and I received this book for free. That was a nice surprise. This book is about two characters in one of this authors series and since I hadn't read that series I wasn't familiar with them but this is a stand alone novella and I didn't need to be familiar with them in order to enjoy this book or understand what's happening. Pia is mingling at a gala when her husband, Brock tells her to be careful. Something is up but he's not allowed to tell her what. Someone is going to be kidnapped but the cyborg's don't know who until it's too late. When Pia is kidnapped and they find out who the kidnapper is, they are shocked. There's a lot happening in this short novella but it was a good story. Good story line and a great twist thrown in. I give this book 3 out of 4 stars.